Universities, Military Reconsider Restoring On-Campus ROTC : It's All Politics The demise of DADT has led some schools to consider inviting ROTC back to their campuses. But practical considerations could keep ROTC from returning, especially on Ivy League campuses. 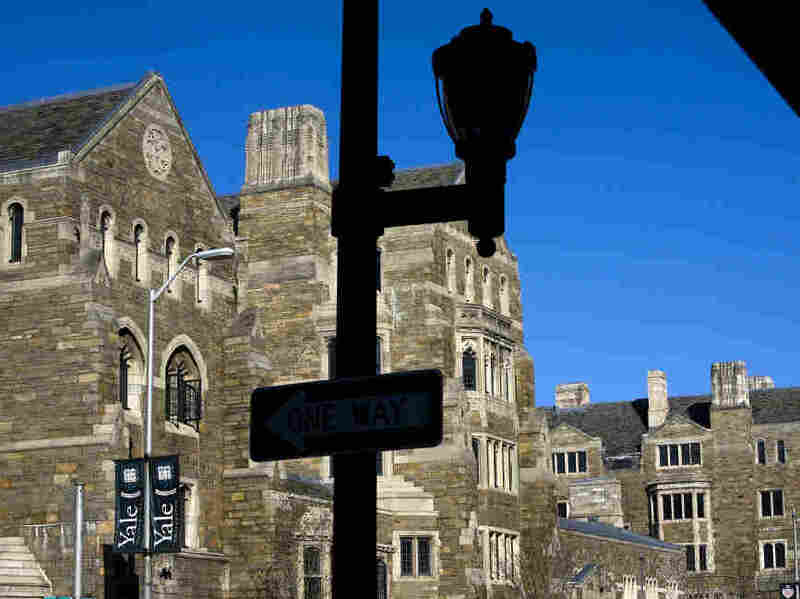 Buildings on the Yale University campus. Mutual suspicion, sometimes verging onto outright hostility between the U.S. military and academia, has been pronounced ever since the Vietnam War. That tension has led many colleges and universities, especially Ivy League campuses, to remain ROTC-free zones, first because of the war, then from opposition to the just repealed Don't Ask, Don't Tell ban on gays serving openly in the U.S. military. In a related situation, during Supreme Court Justice Elena Kagan's confirmation hearing, she was questioned about her role as Harvard Law School dean in the decision to bar military recruiters from campus because of DADT. The Supreme Court in 2006 ruled the federal government could bar federal money from institutions that barred recruiters from campus. Now some schools are revisiting the idea of having ROTC on campus. In his State of the Union address, President Obama urged them to say yes to ROTC. Diane Orson, reporting for NPR member station WNPR in Norwich/New London, CT reported for All Things Considered on the situation at Yale University. DIANE: Yale student Katherine Miller says President Obama's message is clear. The military is becoming more inclusive and that means she'll be able to pursue her dream of a career in uniform. Miller left West Point last year and transferred to Yale because of Don't Ask, Don't Tell, the policy that bans gays and lesbians from serving openly. MILLER: When I entered Yale I had an environment where I knew that I could be myself in. I didn't have to hide my sexuality. I didn't have to pretend to be someone that I was not. DIANE: Miller is among only a handful of students at Yale actively pursuing a military career. The school hasn't had an ROTC unit on campus since the early 1970s. Cadets travel to satellite programs at other schools for their training. The military left Yale and many Ivy League institutions at the height of the anti-Viet Nam war protests. Later, Yale struggled with the Department of Defense over its policy on gays and lesbians. But now, with the repeal of DADT, many elite schools are in serious talks with military officials about bringing ROTC back. Yale College Dean Mary Miller. DEAN MILLER: What we also have been doing is looking very closely at how other institutions that we think of as similar to Yale, how has ROTC unfolded in recent years on their campus. DIANE: But ROTC's return is not a sure bet. For one thing, the repeal of Don't Ask, Don't Tell has not, as yet, been implemented. And the military may not be that enthusiastic about opening additional detachments. There's the question of cost. And Colonel Ray Pettit of US Army Cadet Command in Virginia says the military has to consider student interest. COL. PETIT: On of the downsides with respect to getting the leadership from Ivy League schools is that generally those students perform their required service to the Army and tend to get out the Army at a higher rate than non-Ivy League students do. DIANE: Yale's student governing council recently surveyed interest in ROTC in the wake of the Don't Ask, Don't Tell repeal. TWENTY YEAR OLD JUNIOR JEFF GORDON: Almost 70% of students would support the return of the program given the repeal.